Katydids are part of the grasshopper family, although they have a distinctive leafy look to their wings that acts as camouflage. They have long antennae, often two to three times their body length. Several species of katydids exist and live in different environments, but they all have the same basic needs. Katydids eat mostly leaves and grass, but they've been known to eat fruit and a few tiny insects, such as aphids, as well. In large numbers, katydids can decimate a field of greenery, but such infestations are rare. Typically, you might notice a few bites out of leaves or some missing blades of grass, but nothing that could be harmful to the ecosystem. Unlike grasshoppers, katydids don't spend much time on the ground. They move slowly on the ground, so they prefer to spend their times on tree limbs, tall blades of grass or other plants. This helps them with their camouflage as well -- they freeze when they sense danger and are easily overlooked by predators. They don't need much space, spending most of their lives around the same tree or the same area of a field. The katydids that frequent trees tend to be green to blend in with the leaves, while meadow katydids are most often brown or green with brown accents to blend in better with the grasses. These katydids tend to have narrower wings, more like blades of grass than tree leaves. 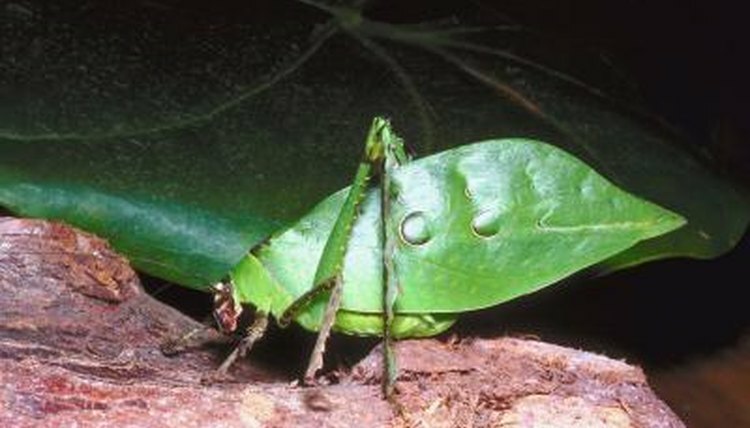 Plants play an important role in katydid reproduction. Some species, such as the field katydid, chew holes in thick plant stems and deposit eggs inside. Others dig holes in the soil at the base of plants or trees for their eggs, while others hide the eggs under piles of sticks. Katydids tend to be more active at night, when they perform their symphony of mating calls. They make chirping noises by rubbing their wings together, and each species has its own distinctive sound. Katydids do most of their eating at night, preferring the cover of darkness to move around to reduce the chance of being spotted by a predator. Although they're not typically social, they recognize each other as they move around at night by feeling with their long antennae. What Are the Eating Habits of the Morpho Butterfly?